I'm sure whenever I mention the word spring roll, it will be the crispy deep fried varieties that you get from Chinese takeaway that sprung to mind. It is now so ambiguous that even supermarket stock them in their ready meal or freezer section. These are all very well and obviously over the years, these crunchy vegetables-filled parcels have become symbolic of typical Chinese cooking but what is on every Singaporean's mind whenever spring rolls are mentioned are altogether a very different thing. Popiah or Poh Piah is what we Singaporean considered as the goto spring roll of choice. Instead of having them deep fried, you get fresh egg pancake rolls, filled with delicious vegetables and meat mixtures. They are incredibly fresh and truly delicious and moreish. It is a shame though as it seems to be completely beyond the radar of any mentions of the best of Singapore hawker food. This is understandable as unlike Hainanese Chicken Rice, Char Kway Teow or Chilli Crab etc, it is not a complete meal due to its size portion. Even back in Singapore, we rarely have it on its own and very often it will the playing second fiddle to a main dish. It's more of a quick snack really. The making of the pancake itself is an art form that can only be attained through years of experience and lots of practise. 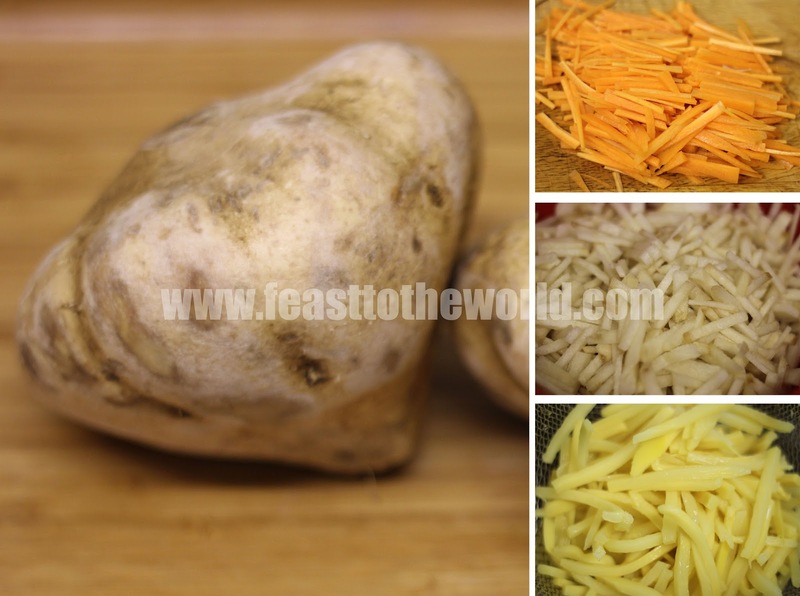 It is made with a mixture of wheat flour, water, salt and egg. These ingredients are mix to form a soft elastic dough. This ball of dough is then rolled onto a hot steel pan and quickly lifted off again. This leave behind a thin layer of dough stuck to the pan which will then be cooked and that produced the right thickness for the rolling. I was always fascinated by the hawker vendors who did this with such dexterity and speed and can only ever aspired to be the same, but alas, try as I might, it is harder than it looked. And so I had to resort to an easier method for now, until the day I become a popiah skin master. 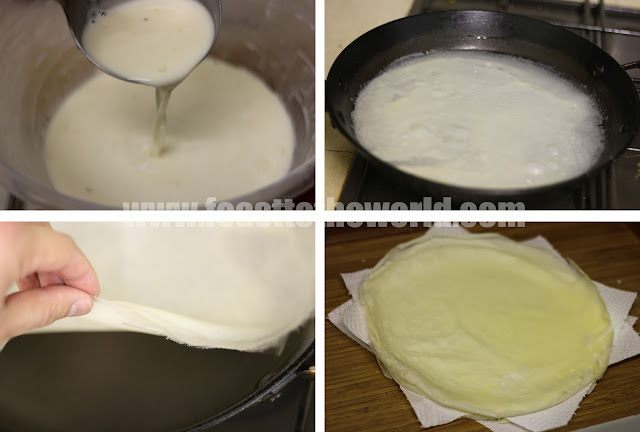 The easier way is to dilute the flour mixture to a pouring consistency and spoon in the mixture with a ladle, just like making a traditional pancake. Less intimidating and much, much simpler. The filling is what set this apart from the Teochew/Hokkien version. 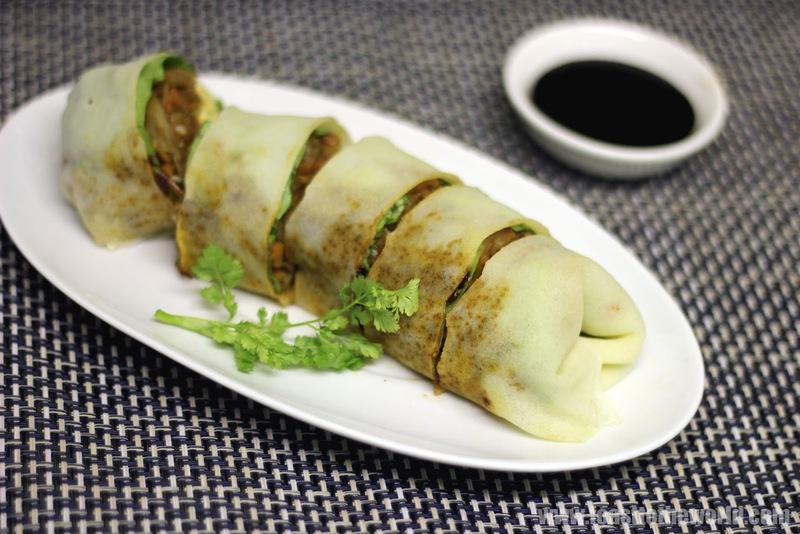 A Nyonya popiah always contained julienned bangkuang (also known as Jicama or yam bean) and bamboo shoots. These are never shredded (shock horror my nan will be if she see that). Each element had to be painstakingly cut into batons by hand to provide the right consistency and texture with each mouthful. The ratio of the bangkuang to bamboo shoots too plays a very important part, there should always be at least twice as many bamboo shoots. In fact, according to my nan, the more the merrier. Another key difference is that the vegetable are cooked in taucheo (a typical Nyonya condiment) and a prawn-pork broth. I have opted to do without the stock here as I have made a vegetables version but if you are making a meat version*, just boil the pork and prawn shells in some water for 30 minutes, strain and use it in place of the water in the recipe. On the day I was making this delectable treat, I had also made some Ngoh Hiang (a five-spice meat roll which I will write about in my next post) and thus unknowingly, dishes out a Yin-Yang spring rolls for a double whammy of home comforts.....and it was indeed a very welcomed nolstagic meal. To make the popiah skin, beat the eggs together in a large bowl and gradually sift in the flour and salt. Mix well before adding the water and oil and stir to form a light batter, just enough to lightly coat the back of a spoon. Return the pan to the low heat and cook for 2-3 minutes, until the popiah skin is cooked and the edges curl away from the side. Peel the skin away from the pan with your fingers and transfer onto a plate. Repeat the process with the rest of the batter, stirring every time before use as the flour tend to sink to the bottom. Keep each skin separated with a kitchen paper and cover the popiah skins with a damp cloth to prevent them from drying out. To make the filling, heat the oil in a a wok or a pan until smoking. Add the garlic and stir-fry for 30 seconds, until fragrant and add the fermented soy bean paste. Cook for 1 minute and add the yam bean or turnip, bamboo shoots, carrots, dark soy sauce, sugar and salt. Stir-fry for another 2 minute before adding the water and bring to the boil. Lower the heat and simmer for 20 minutes until the vegetable are tender and cooked. Transfer to a large serving bowl and leave to cool. To assemble the popiah. Lay a sheet of popiah skin onto a work surface, spread about half a teaspoon of kecap manis along with a little bit of crushed garlic and chilli paste onto a corner of the popiah. Add a piece of lettuce, then the cucumber, bean sprouts, egg omelette and a heaped spoonful go the filling. Sprinkle the fried garlic and shallots and top with a few sprigs of coriander. Fold one side of the skin tightly over the filling, the fold the left and then the right side toward the centre to enclosed the filling. Roll up to form a cigar shaped with the seam side down. Trim off any excess if you want for a neater presentation. 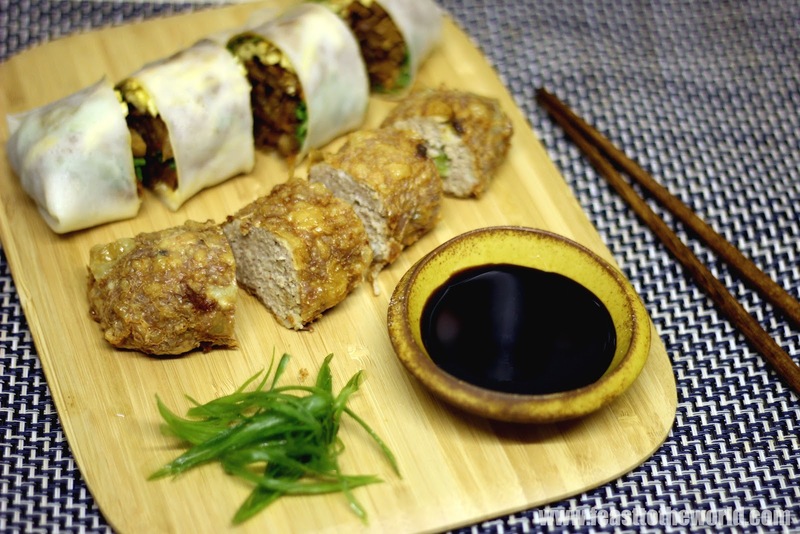 Slice the roll using a sharp knife and serve along with some kecap manis and chilli sauce for dipping. 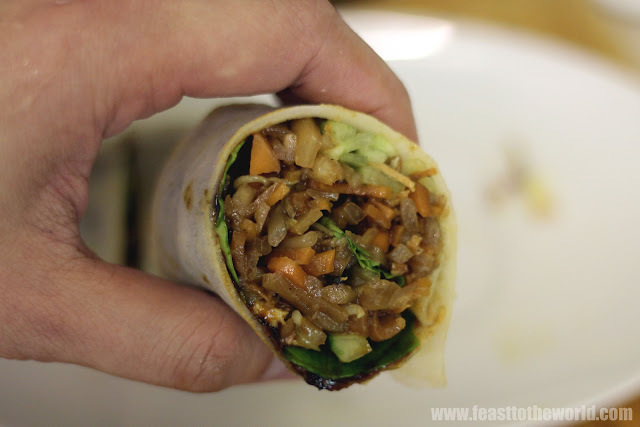 I loved the popiah rolls I had in Penang, they were awesome; credit to you for making your own! These look great. Thanks Lizzie! The ones you had are most definitely the nyonya versions... lots of peranakan live in Penang. I love popiah! I tried to make the popiah skin last time with a different method last time. Yours look a lot easier! 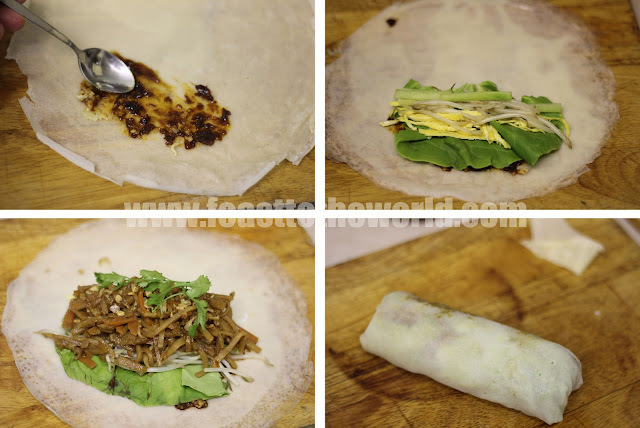 Yes, I've tried a few different ways of making the popiah skin and this is definitely the easiest method. YESSS! Finally I can remake the dishes I crave so much. From a fellow Singaporean in New Zealand.